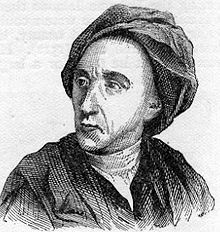 An Essay on Man is a poem published by Alexander Pope in 1734. It is a rationalistic effort to use philosophy in order to “vindicate the ways of God to man” (l.16), a variation of John Milton’s claim in the opening lines of Paradise Lost, that he will “justify the ways of God to men” (1.26). It is concerned with the natural order God has decreed for man. Because man cannot know God’s purposes, he cannot complain about his position in the Great Chain of Being (ll.33-34) and must accept that “Whatever IS, is RIGHT” (l.292), a theme that would be satirized by Voltaire in Candide (1759). More than any other work, it popularized optimistic philosophy throughout England and the rest of Europe. Pope’s Essay on Man and Moral Epistles were designed to be the parts of a system of ethics which he wanted to express in poetry. Moral Epistles have been known under various other names including Ethic Epistles and Moral Essays. On its publication, An Essay on Man met with great admiration throughout Europe. Voltaire called it “the most beautiful, the most useful, the most sublime didactic poem ever written in any language”. In 1756 Rousseau wrote to Voltaire admiring the poem and saying that it “softens my ills and brings me patience”. Kant was fond of the poem and would recite long passages of the poem to his students. However later Voltaire renounced his admiration for Pope and Leibniz’s optimism and even wrote a novel, Candide, as a satire on Pope and Leibniz’s philosophy of ethics. The essay, written in heroic couplets, comprises four epistles. Pope began work on it in 1729, and had finished the first three by 1731. However, they did not appear until early 1733, with the fourth epistle published the following year. The poem was originally published anonymously; Pope did not admit authorship until 1735. Pope reveals in his introductory statement, “The Design,” that An Essay on Man was originally conceived as part of a longer philosophical poem, with four separate books. What we have today would comprise the first book. The second was to be a set of epistles on human reason, arts and sciences, human talent, as well as the use of learning, science, and wit “together with a satire against the misapplications of them.” The third book would discuss politics, and the fourth book “private ethics” or “practical morality.” Often quoted is the following passage, the first verse paragraph of the second book, which neatly summarizes some of the religious and humanistic tenets of the poem. Previous Previous post: Baby sleep problem – How to solve? Next Next post: Criticise them – But how to do so safely?